Marketing your business both on and offline is easy if you follow these 20 steps. This guide will help you with advice on your branding and any promotions you might be planning. 1. 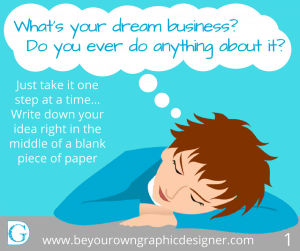 What’s your dream business? Do you ever do anything about it? …you know the idea… that one that’s been buzzing around for ages at the back of your head. Is it calling to you..? Of course, it is… that’s your dream calling. 2. 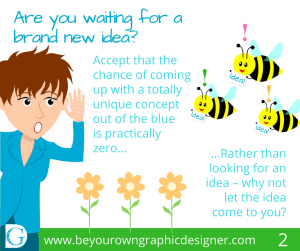 Are you waiting for a brand new idea? Accept that the chance of coming up with a totally unique concept out of the blue is practically zero. Rather than looking for an idea – why not let the idea come to you? Remember NOTHING IS TOO WACKY and NOTHING IS TOO EXPENSIVE or COMPLICATED at this stage! 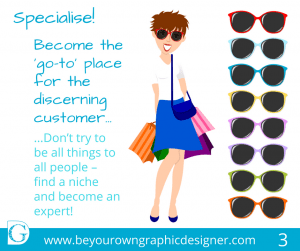 Don’t try to be all things to all people – find a niche and become an expert! This is an easy trap to fall into but if you offer too much you will confuse your potential customer and could scare them away. 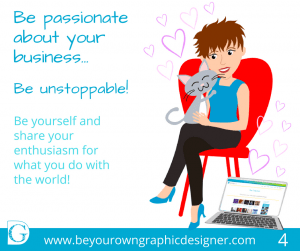 You need to be yourself and share your enthusiasm for what you do with the world! Your passion and enthusiasm for your business will enter into every interaction with customers, suppliers, friends and colleagues, they will catch your passion (rather like positive- flu!). Branding is so much more than just a logo. It’s an unspoken contract between you and your customers. 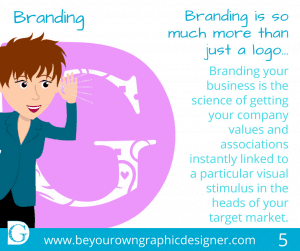 Branding your business is the science of getting your company values and associations instantly linked to a particular visual stimulus in the heads of your target market. Your brand should be unique and used consistently. 6. Be Unique! Be Yourself! 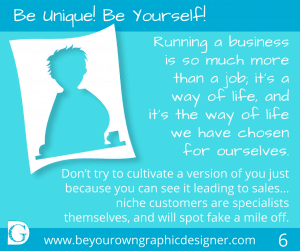 Running a business is so much more than a job; it’s a way of life, and it’s the way of life we have chosen for ourselves. Don’t try to cultivate a version of you just because you can see it leading to sales…niche customers are specialists themselves and will spot fake a mile off. YOU are unique – there is no one in the world like you and believe me when I say that THIS is your primary USP (unique selling point). 7. 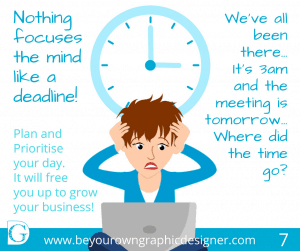 Nothing focuses the mind like a deadline! It’s 3 am and the meeting is tomorrow… Where did the time go? Plan and Prioritise your day, it will free you up to grow your business! You know it makes sense and the results will be so much better if you give yourself time to get it right. 8. Step out of your comfort zone! 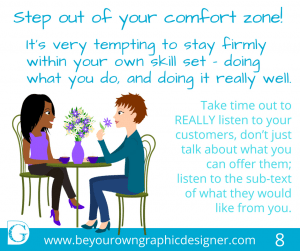 It’s very tempting to stay firmly within your own skill set – doing what you do, and doing it really well. The world and business environment around us continue to change. Take time out to REALLY listen to your customers, don’t just talk about what you can offer them; listen to the subtext of what they would like from you. 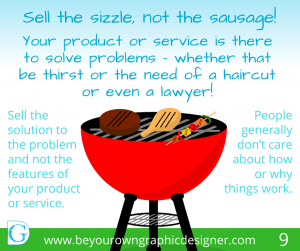 Your products or services are there to solve problems – whether that be thirst, the need for a haircut or legal or financial advice! Because you spent time developing your products, it’s easy to fall into the trap of marketing your business features, not benefits. You need to sell your solution to your customers’ problem and not the features of your product or service, (generally, people don’t care about how or why things work). I’ve never really understood why some promotions really worked and some, well… just didn’t. I have finally boiled it down to just one thing. It’s not about being a great artist, an imaginative genius or computer whizz kid. It’s about visually and emotionally connecting with customers so that they do the ONE thing you want them to do. 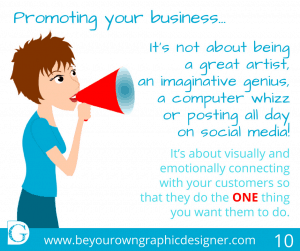 All promotional and on and offline marketing HAS to be centred around just one person – your target customer and defining WHO your target customer is as precisely as possible is key. Do they shop on or offline? What do they spend their disposable income on? Do they have particular likes and dislikes? What hobbies and pastimes do they enjoy? What online groups do they belong to? Are there any restrictions on when and how they buy, for instance, time of day? Any other features specific to your business, for example, do they drive a car? Think of WHY they need your help – what precisely is the problem they need solving? Do friends choose a café because they are thirsty…or to sit down for a few minutes and chat in pleasant surroundings? Really try to drill down to find out the TRUE reasons for your customers’ needs – you may be surprised at what you find. Now think of how, where and when THEY will find it easiest and most convenient to access your solution? Be careful– it might not be the obvious reason you first think of…for instance, does someone get a haircut because their hair is too long…or because they want to look good? What is their reason for needing an XYZ widget? Build your campaign around what will appeal to them. Whatever you do, avoid the trap of thinking that you are your customer. Really take the time to ‘get into the head’ of your ideal consumer/client and think of how to make it as easy as possible for them to react to the images and messages you are sending out. It will pay HUGE dividends if you do. 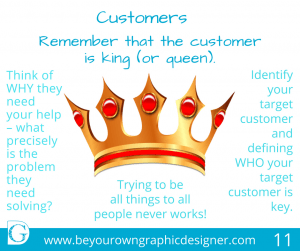 Once you have defined your ideal customer and you know where they will be looking, you now need to think of a CONCEPT. 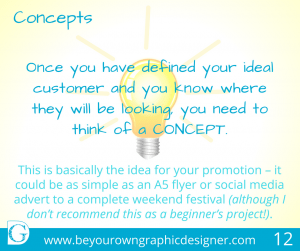 This is basically the idea for your promotion – it could be as simple as an A5 flyer or social media advert to a complete weekend festival (although I don’t recommend this as a beginner’s project!). Apart from myself, what is the USP (Unique Selling Point) for this promotion? Why will this appeal specifically to my identified customer? What is the best way can ensure my identified customer gets to hear about my promotion? Are there particular media they already access, read, listen to or watch? What exactly do I want them to do when they read or hear about my promotion? How have I made it really easy for them? 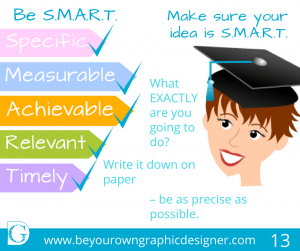 Make sure your idea is S.M.A.R.T (Specific, Measurable, Achievable, Relevant and Timely). Specific: What EXACTLY are you going to do? Write it down on paper and be as precise as possible. My plan is to boost business visiting my cafe on weekday afternoons in August. I’ll distribute 2,500 A5 leaflets in our local town newsletter, advertising a buy-one-get-one-free (BOGOF) option for weekday afternoons (2 pm – 6 pm). I’m going to promote my new menu in the cafe by putting up posters (big versions of my leaflet) in the windows and writing on the chalkboard outside. I’ll contact my local radio station and ask them if I can come and chat about ‘a day in the life of a cafe owner’ or something similar, and take the opportunity to put in a word about my offer while I’m on air. I’m going to run a competition, which I’ll promote on the leaflets and organically (that’s not paid for) on Facebook and Twitter. It’ll let them know all visitors to the cafe who make a purchase during August, and leave their name and email address so they can be contacted if they win, will be entered into the competition to win a free meal for 4 in September. How will you know if you have achieved your goal? 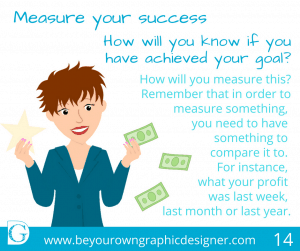 Remember that in order to measure something, you need to have something to compare it to for instance, what your profit was last week, last month or last year. My profit for this month on weekday afternoons will be twice the profit I made in July. I’ll gather entries to my competition from 50% of my customers and increase my email list at the same time. I’ll ask customers to leave a comment about how they enjoyed their visit and make sure I address any problems immediately. I will post good comments on Facebook and Twitter. 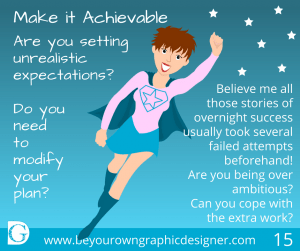 Have you set unrealistic expectations – do you need to modify your plan? Are you being over ambitious? Can you cope with the extra work? 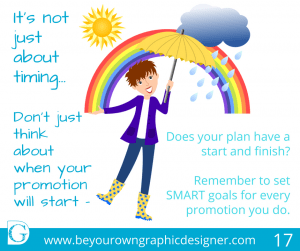 Have you given yourself enough time to plan it and advertise beforehand? It may take more time than you think to become an overnight success! 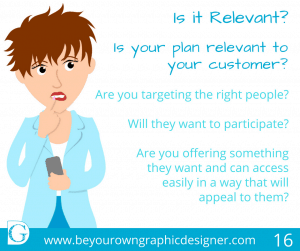 Is your plan relevant to your customer? Will they want to participate? Are you offering something they want and presenting your offer in a way that will appeal to them? Think about what time they will be in town– for instance during August when the promotion is running Mums will have their children with them as it’s the summer holidays. Could you include some child/mum-friendly options in your offer to attract them? Will they be able to participate? For instance, office workers will be working in the afternoon so they are not in your target market. Does your plan have a start and finish? If not, it should! For example, my promotion will run from 1st to 31st August. Is it specific about when the promotion applies? For instance, my promotion is between 2pm and 6pm on weekdays only. List the things you’ll need to include in your design to achieve your CONCEPT. Images or photographs– possibly both! And of course, don’t forget to add your business contact details, opening times, offer times, anything else relevant. This is where it gets creative… it’s really down to using your loaf!! As long as you have worked through the above steps, the design itself becomes really straightforward to do. 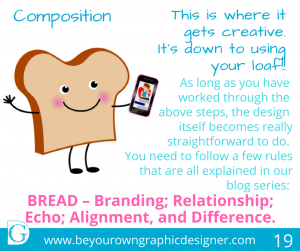 You need to follow a few rules that are all explained in our blog series: BREAD – Branding; Relationship; Echo; Alignment, and Difference. 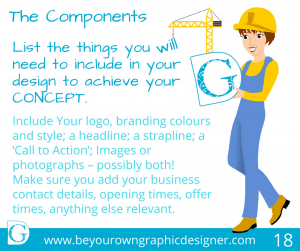 Even if you don’t know a thing about graphic design we can help you! 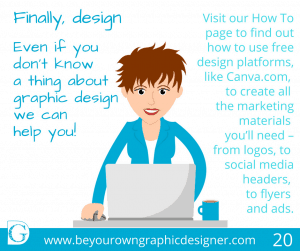 Visit our How-To page to find out how to use free design platforms, like Canva.com, to create all the marketing materials you’ll need – from logos to social media headers, to flyers and ads. A great help to make marketing your business easy and look professional! All the images and the infographic in this blog were designed on Canva. Follow these 20 Steps to make marketing your business stylishly simple! If you like the images in any of our blogs, similar images are available for you to buy and download from our Collection.